Trophies2Go is dedicated to your company’s success by helping you with your employee of the month recognition program. 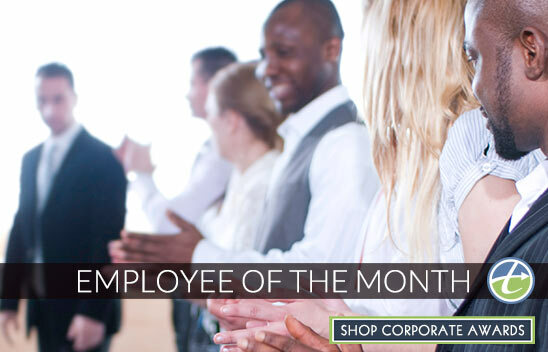 No matter your taste or style, our Employee of the Month plaques and business awards have the "wow" factor you, your boss, and your company are looking for, perfect for your monthly winners! We take the hassle out of ordering monthly recognition awards for your top employees. Our employee of the month plaques and awards are masterfully crafted with one-of-a-kind engraving, included in the price. We offer Fast Production Times, so you are in control of when you get your order; you choose the delivery date. Our Fail Safe Engraving System gives you approval of your engraving layout before it goes into production. Our goal is to make you look good, with a cherished award that stands the test of time. Need help deciding which employee of the month plaque or award is right for you? Our customer service team has the personal touch to help you choose amazing employee recognition awards unique to your organization. Give us a call now at 1-877-926-4700 or visit our live chat for ideas!